The fastest way to obtain headache relief, as well as one of the safest ways, is to drink down powdered aspirin, magnesium, and vitamin C mixed in water to your body without gastrointestinal ulcers, or stomach bleeding. With headaches, it is often a darn if you do, and a darn if you do not, situation. Left untreated, a persistent headache can easily lead to nausea. Treating a headache with aspirin in tablet form, however, can likewise result in stomach nausea. In the States, the best solution is shaking up a BC, Stanback, or Goody's Powder with a 3 quarters full tumbler of water. Warmer water dissolves the powdered aspirin, better. Aspirin works best when taken along with a small amount of vitamin C. In short, the secret to fast headache relief lies in using the correct technique to deliver the aspirin to your body. Adding one quarter teaspoon of powdered vitamin C to the water, in lieu of taking it in tablet form, would be highly advisable. Powdered ascorbic acid is available from a variety of different sources. Evitamins off of the Internet, for example, sells the Now brand of Vitamin C Crystals in quantities as small as 8 ounces. Taken this way, powdered aspirin does NOT cause stomach upset in most people. If you suffer from a sensitive stomach then simply drink down the powdered aspirin, along with a small scoop of whey protein powder, either simultaneously or immediately afterward. In other words, shake the whey protein powder up in a tumbler full of water and drink it down. Other things can be substituted for whey protein powder, such as flaxseed meal or ground up flaxseed. Now a days, even Walmart is selling the Wild Oats brand of organic ground Flax seed, which can be conveniently stored inside your freezer. Walmart, of course, also sells whey protein powder. Another trick is to cut open a capsule of powdered magnesium citrate with a pair of scissors, which you are probably already supplementing with, and add it to the water. The magnesium will naturally neutralized the acid contained in the vitamin C as well as provide its own anti-inflammatory effect for better brain health. In general, aspirin should not be used when suffering from influenza, in small children, nor on a routine basis. Aspirin works best in adults, for occasional headache relief. Remember that aspirin was originally a herbal treatment obtained from willow bark extract. In recent years, aspirin has been unfairly vilified in the natural health community. Just like vitamin C, aspirin is usually synthetically prepared, but works just fine. While synthetic vitamins should be avoided in some cases, for both aspirin and vitamin C, the commercially produced synthetic stuff works great. Both BC Powder and the Stanback Headache Powder formulas contains 845 mg aspirin and 65 mg caffeine. Goody's Powder contains 520 mg aspirin, 260 mg acetaminophen, and 32.5 mg caffeine. 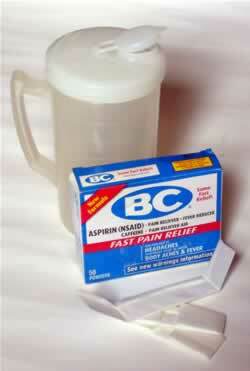 An acetaminophen version of BC Powder, is available. Whether or not you want, an acetaminophen formulation depends upon how well it works at relieving headaches in yourself. In a pinch, acetaminophen version products provide similar relief, even if the Natural Health Perspective prefers a straight aspirin formulation. Relief should begin to kick in within one hour. If you still have a headache, 2 to 3 hours later, simply follow up with a second dosage. Alternatively you could try taking both powdered ascorbic acid and magnesium shaken up in a tumbler of water without any aspirin at all, as a second dosage. This article was originally published on 01/02/2013. Perneger TV, Whelton PK, Klag MJ. N Engl J Med. 1994 Dec 22;331(25):1675-9.